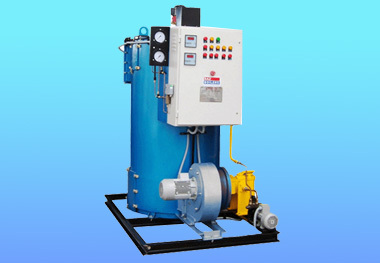 Oil Fired Hot Water Generators, Gas Fired Hot Water Generators, Manufacturer, Exporter, Supplier, Pune, Maharashtra, India. Majorly we export products to customers from Gulf, Asian & African countries etc. HOT STREAM is a fully automatic Hot Water Generator. In any abnormal conditions either due to no fuel oil, low water level, high water temp., high stack temp, low pressure switch, HOTSTREAM shuts off & gives an alarm, indicating fault on control panel, so we can easily rectify the fault. Coil Type – 50,000 to 50,00,000 kcal/hr. Fuels - LDO, HSD, FO, LSHS, Natural gas, LPG, Biogas. 1. High Efficiency—Less Fuel consumption. 4. No water treatment required when used with Calorifier. 5. Smokeless combustion. Low Pollutants. 6. No explosion hazards due to coil design.